Cadi is tired of being a background comics character and wants something different. Nothing could be more different than the enigmatic Tressa popping up in Cadi's comic world without warning. A crowd looks up at the sky in fear. 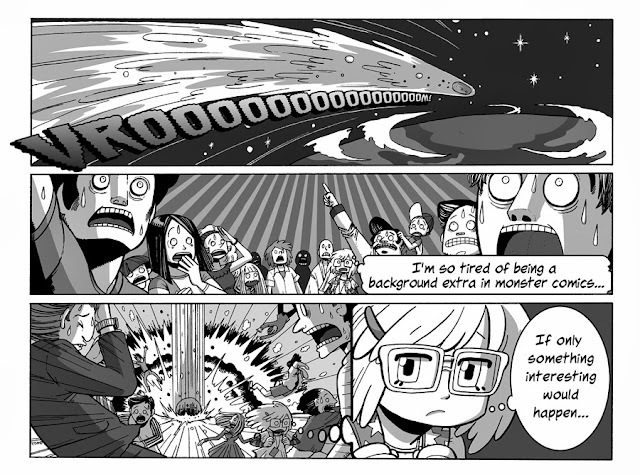 A girl in the crowd (Cadi): (thinking) I'm so tired of being a background extra in monster comics..."
The meteor strikes the ground causing a huge shockwave that sends the crowd flying through the air in all directions. Cadi is focused on her own thoughts. Cadi: (thinking) "If only something interesting would happen..."
Welcome to the first installment of Hexenringe by patokon and Tomoko Hirabayashi! We'll update every Sat. so stay tuned! Patrick Ijima-Washburn is a writer/artist living in Japan and the author of The American Comics Sound Effect Dictionary and Punchkinhead, the Never-Give-Up-Boy. His work can be viewed on his homepage patokon.com. Tomoko Hirabayashi is an illustrator/artist/comic creator based in Tokyo. Her official home page is beepbap.com.